Like most people I get a lot of e-mail spam. Sure, I get my fair share of offers for cheap drugs — mostly Viagra — and offers for various “relationships.” And you probably wouldn’t be surprised to learn that a bank in Nigeria has lots of money waiting for me. 1. Grammar is important. Ditto punctuation and spelling. I personally never respond to pleas over the internet to give money for a toddler’s lung transplant in Ethiopia unless everything is spelled properly. 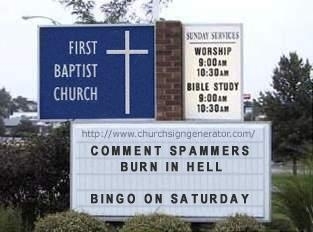 Don’t they have spell check in the spammer’s lair? 2. Speaking of the spammer’s lair, you need to set up your own version of the man cave. You can call it the Spam Cave if you wish, but know that I have copyrighted that term. A proper Spam Cave should have cabinets chock full of Hormel Spam. 3. You are not the apostle Paul. Please do not begin your “epistles” in the same manner ie. “Grace and peace to you from God our Father and the Lord Jesus Christ.” Also Paul never used “dearest” as a term of endearment. 4. The subject line of an e-mail is important. Some not to use (which I have seen) include “21 BIBLES PLEASE HELP” (also, typing in all caps does not add urgency; it adds annoying); “Apostolic Greetings !! !” (who exactly is the apostle here? You? Me? It’s definitely not me); “Browse hot singles in your area for unattached…” (wait, that was for something else); “Greetings From Yours Sincerely Sister in Christ” (I think you’ve confused the concluding valediction with the subject line). 5. Finally, please send me your e-mail address so I can bombard you with monetary scams couched in the language of faith. Don’t worry, Jesus would want me to do this. The bad grammar and spelling is intentional. Those who don’t catch it are quickly identified as easy marks for the scam du jour! Spell checker often misses the difference between liar and lair. I I wasn’t sure exactly which one you meant until you described it as a Spam cave. Although some people would say that if we call Spam a meat product, we are liars. Now I am confused again. I’m not doubled over with laughter because I’ve gotten too many of those and/or similar ones. What’s scary is the actual number who believe this stuff and respond affirmatively. 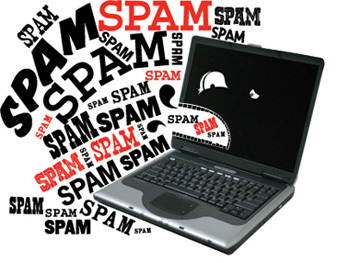 Now if only all your spammers were subscribers to your blog…..